Was it the SWELL conference? The additional exchanges that have added XRP to their global currency pairings? Adoption of xRapid by financial institutions? Whatever the cause, those of us that actively track volume on a daily basis know that the normal numbers have now increased substantially. XRP Investors are quietly entering a new era. The average daily volume has started to expand rapidly; it's an auspicious moment to pause and perform some due diligence as an investor. Let's look at the supply side of the XRP equation, and analyze it together. By the Numbers: Whose XRP? You might wonder why Ripple chose to put 55 billion into escrow instead of 60 billion; if you've been following the legal proceedings between Ripple and R3, then you're probably aware that these two organizations are currently arguing over 5 billion XRP through the courts.3 Wisely, Ripple is (evidently) opting to keep this amount available pending the outcome of any legal proceedings. 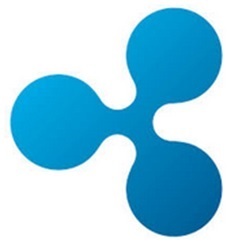 Note that this last point is merely speculation, as Ripple has chosen not to make any official statement about the connection between the escrow amount and its lawsuit with R3. Rounding out XRP Distribution: There is 38 billion XRP in the hands of investors and Ripple business partners throughout the world. While some point to Ripple's holdings as a sign of strength and as evidence of the competitive advantage that this provides to the company, other crypto investors are leery of any centralized organization owning such a significant portion of the distributed currency. "To build XRP liquidity, we have been mindful over the years about how we distribute XRP. Our goal in distributing XRP is to incentivize actions that build trust, utility and liquidity. We engage in distribution strategies that we expect will result in a strengthening XRP exchange rate against other currencies. We have a proven track record of doing just that." It is clearly in Ripple's interest to foster a healthy XRP market where no single investor has the ability to independently affect price; this is why the company chose to voluntarily lock away 55 billion XRP. I genuinely appreciate that Ripple takes XRP supply so seriously. The terms of the lockup were relatively flexible at the time of the announcement. Remember, it was May when the escrow idea was communicated, and I'm sure for those involved at Ripple it seemed that the end of 2017 was in the distant future! However, as we near the final month of 2017, the community of XRP investors is now anxiously awaiting news of the escrow lockup. The terms of the lockup provide that each month, Ripple will be "sent" 1 billion XRP. 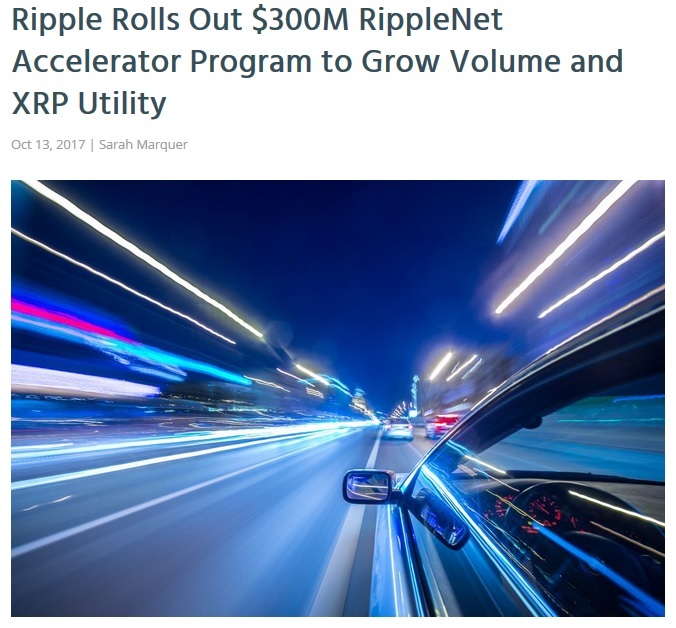 Ripple's plans for this XRP no doubt coincide with the goals for the RippleNet Accelerator program - to speed adoption and build liquidity for XRP. 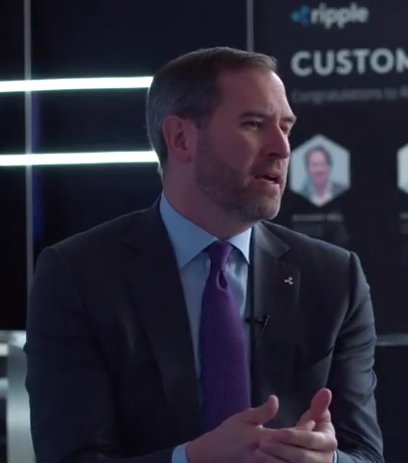 As xRapid gains more and more traction through the end of 2017 and early 2018, Ripple will be looking to forge massive gains in liquidity. Looking back in history can be entertaining - the current levels of XRP liquidity are double the entire top ten crypto-currencies from just one year ago! In addition to looking at the high-level custody of XRP by various groups, it's wise to zero in on the non-Ripple group and delve into the holdings of individual accounts. To do this, the XRP investor community employs the same APIs that power the applications that run on the XRP Ledger, and query it to provide statistical summaries. The following statistics were provided by the founder of the XRP Discord group.6 He regularly queries the network to obtain the data, and then re-formats it into a consistent style to make month-over-month comparisons. Clearly, these charts include holdings by Ripple and possibly a small number of large investors. While two months doesn't reveal a wide change, it does indicate that the overall numbers of large accounts has decreased, which is expected as time progresses. This chart is the one where it's easy to look and see what it takes to be in the XRP holders' "top 1 %." At the beginning of November, it would take approximately 185,000 XRP for you to be considered in the "top 1%" of XRP holders worldwide. How does this compare to the September numbers? 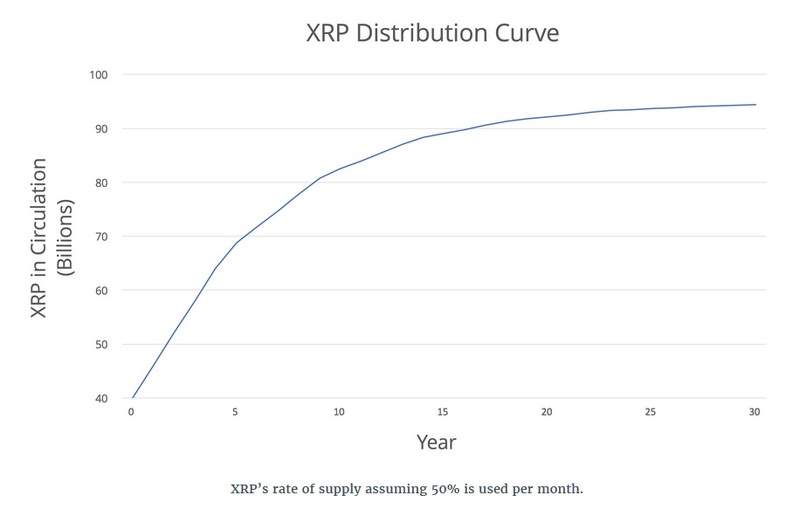 As the amount of XRP in each bracket decreases, it indicates greater distribution of XRP across more newly-established accounts. This is the exact trend that we expect to see, and keep in mind that these dramatic differences occurred in only two months. New investors are typically fascinated by a concept of XRP that is not normally found in other crypto-currencies; the "burning" of the native asset as it's used in transactions. Yes, it's true. XRP is destroyed by each transaction.7 Granted, the amount is extremely small - ten drops is the amount of XRP that is currently used. How much is a drop? A drop is one millionth of one XRP. So that translates to the current fee of 0.00001 XRP. Even though this amount is very small, over the course of 34 + million ledger closes, the destruction of XRP through transaction fees has added up to a material number: 6.8 million XRP.8 While the current number is small, if increasing numbers of banks and financial institutions adopt XRP as a bridge currency, the supply of XRP could eventually be reduced by a more significant number. Often on social media, I see the question "Will the XRP Ledger ever run out of XRP?" It's a fascinating question that assumes that the current fee structures will remain the same, despite global payment volumes in the trillions. Yet another question - a good one - has to do with reserve requirements for wallets. "If the price of XRP rises substantially, will the current account activation cost become too expensive for users?" The answer to the first question is "No, the XRP Ledger should never run out of XRP." The answer to the second question is "The reserve amount can be lowered to accommodate a higher price of XRP." "If a quorum of validators agrees on a change, they can apply a change that takes effect thereafter. Validators may do this for various reasons, especially to adjust to long-term changes in the value of XRP." Crypto investors are wise to actively track their investments, especially given the latest instabilities with Bitcoin. If it's not forks, then it's unpredictable price movements! And the latest price movements and schisms within Bitcoin are historic in proportion. 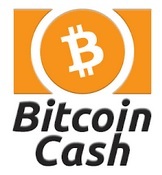 Bitcoin Cash, a little-known crypto outside of those that follow the industry, is now challenging Bitcoin for the top spot in crypto. So what does this have to do with XRP? The volume measurements in crypto as these price movements happened in the last two days should be measured on the Richter Scale. Normally, I would expect to see day-over-day volume of Bitcoin transactions measured somewhere in the range of 2+ billion on a normal day. But not in the last two days. We've seen not just one, but two crypto-currencies exceed $8 billion in daily volume in 24 hours!10 This massive increase in volume portends a shift in the markets that we've known would happen and have been waiting for; the entry of mainstream capital and investment bank interest. While these massive shifts in capital have so far pertained to Bitcoin's agonizing governance struggles of late, it shows that we've now officially entered a new phase of capital investment in crypto. The time frame when die-hard crypto fans can secretly and slowly accumulate XRP are drawing to a close - the final days of 2017 will hold some interesting surprises for XRP and all of crypto.